Yes I know, these posts always start with moi saying "Oh I can't believe another month is over, it went by so quickly". Well let me tell you folks, this has been the longest month ever in my life, ever. It feels like payday was ages ago and I have been living on twigs and dust since Christmas and been on a spending ban for the month. I've had fun playing with some new products and reacquainting myself with some old favourites and without further ado, these are the products that helped me through the long month of January 2012, I'm not sorry to see the back of it! First up is Avon. Yes, I know, I've been harping on about it for ages now but I really do love the collection and I've used these bits the most so far. 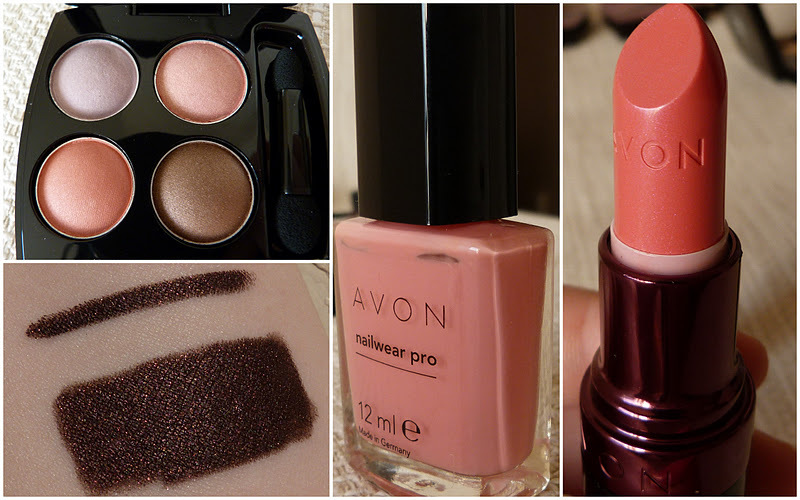 Mystery Palette, Blackberry SuperShock Gel Liner, Apricot Mystery Nailwear Pro and Apricot Mystery lipstick. I've had a look at some ebrochures from Avon reps online and all of the products from the Smoke and Mirrors collection are on sale! So snap them up while there's a bargain to be had. Obsessed isn't the word when I speak of my love for The Body Shop's Moringa Shower Gel. Or maybe it is. Am coming to the end of this bottle of happiness and I will be buying another one until Spring is over. This makes me feel positive that Winter is fading away! I have loved and then mourned the fact that Clinique's Stay-True foundation is not only made for me, but is discontinued. Am raging. If I head to the CCO in Antrim any time soon, I'll be buying back ups. Stay tuned for a full review of this wonderous foundation. Behold my new camera that I got for my birthday and Christmas. The camera that I still don't know how to use properly. Intelligent Auto is the only setting I have played with so far. I still can't do macro shots properly yet which annoys me since I'm following what they say to do, but once they start talking aperture, I'm gone. I might look into doing an evening course on how to use it properly! It does do brilliant quality videos though, phew, at least I can do one thing properly on it. Chanel's Rouge Allure Laque in Empire was my Christmas present to myself. It was love at first swatch. I'm raging to find out that the Rouge Allure Laques are also being discontinued. This is just mean. First my foundation and now this? One of my favourites of the month was people's reactions to my letter to 19 year old me. I had so many lovely comments, emails, texts and even texts to Joanne and I was so touched and overwhelmed by people's kind words, so if you left me a comment or "Liked" the post on Facebook, thank you. It was good to look back over the last few years and see that after everything, I'm OK. So that's January over, bring on February! You're more than ok, you're fabulous! Thanks Andreea :) It doesn't have a flash that pops up like yours to give me heart failure! Thanks Ashesela, still getting the hang of it! Thanks Kat, Intelligent Auto is my friend :) Although when I take pics of my eyeballs and go to crop the pics afterwards, it's not as crisp as my old camera, must play around more! Wowzas. That eyeliner is amazing, very pretty. 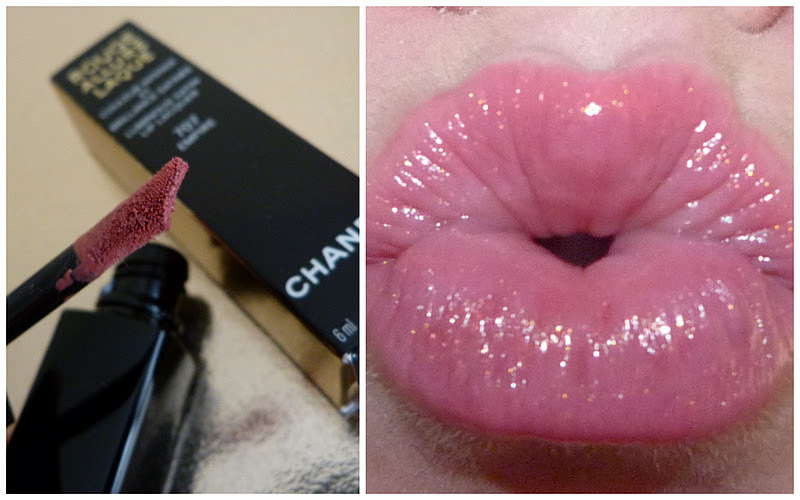 ALso loving the Chanel lipgloss. Sara, you have good taste, what can I say! OMG Karen this Avon gel liner looks sooooo pigmented and smooth, it's absolutely gorgeous! Hopefully they have them in Canada Gaby, or you'll have to do a bit of internet shopping! I love the eyeshadow set, such nice spring colours! I'm a new follower. If you like what you read on mine, I would love it if you followed me back. You deserve every one of those lovely comments, calls, texts and emails about that letter post. I love the look of your camera. Love the shades of pink and that palette iso so versatile !